Location/ Directions: US-75, Exit 26, Campbell Road, and make the 1st U-turn at Campbell Road onto the Southbound Service Road. Take a right onto Gateway Blvd. Gateway Blvd comes directly after Fadis Restaurant. Hotel is on the left. 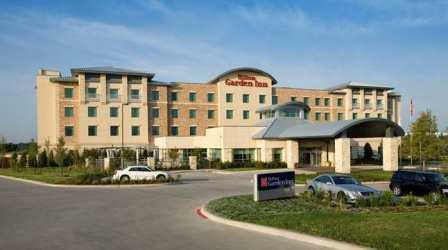 About Hotel: 4-Floors , 127-Rooms, Business Center, Free High Speed Internet, Pool, Truck/Bus Parking, Guest Laundry, Gift Shop, 100% Non-Smoking Property, Elevators, Ice Machine, Vending Machines, Wake-Up Calls, Fitness Center, Outdoor Pool, No Pets Allowed, Hairdryer, Free Local Telephone Calls, Air Conditioning, Alarm Clock, Connecting Rooms, Cribs Available, Desk, Ergonomic Chair, Rollaway, Self-Controlled heat-air conditioner, Iron/Iron Board, Free Newspaper, All rooms Non-Smoking, Coffee/Tea Maker, Microwave, Mini Refrigerator, High Speed Internet Access, Color Cable/Satellite HDTV. Railroad View: Expect an Excellent View. Ask for a high floor room on the south west side of the building (rooms needed will overlook North Collins Blvd.). 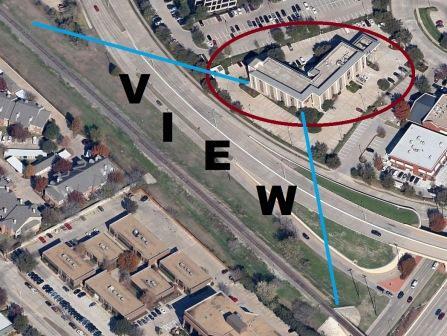 Photo Comment: The aerial image shows the Wingate Hotel circled in red, the single track railroad is located just across North Collins Blvd. The blue lines show the expected view from upper floors. Trees near the hotel may diminish the view from lower floor rooms. Location/ Directions: From downtown Dallas/US-75/Central Expressway: proceed north on US-75/Central Expressway. Exit President George Bush Turnpike headed west, exit Independence Parkway/ Waterview Parkway; turn left onto the eastbound Turnpike service road. Hotel will be on the right. About Hotel: 4-Floors, 125-Rooms, Interior Corridors, Pets not allowed, Business Center, Cribs, High chairs, 24 hr Pavilion Pantry Market, Bar Area, Coin Laundry (fee), Elevators, Gift Shop, Laundry, Local Area Transportation, Lounge, Room Service, Fitness Room, Pool, Air Conditioning, Arm Chair with Ottoman, Black-Out Curtains, Clock Radio w/ MP3 Connection, Ecgonomic Desk Chair with desk, LCD Flat Panel cable TV, Thermostat (adjustable), Coffee Maker, Hairdryer, Free High Speed Internet, Iron/Ironing Board, Microwave, Mini Refrigerator, Newspaper (M-F), Self Laundry Available, Speakerphone with Voicemail. Railroad View: Expect a Good Distant View from upper floor rooms. Ask for a high floor room on the back side of the hotel. The railroad is in the distance. Binoculars / zoom lens will be needed for a better view of passing trains. Shortline freight railroad Dallas, Garland & Northeastern (DGNO) is the railroad that passes the hotel east to west, with luck and a good pair of binoculars you may be able to catch the Kansas City Southern line just to the southeast. Both lines are slightly elevated in the area which helps the view from the hotel. Railroads past Hotel: Dallas, Garland & Northeastern (DGNO), a shortline freight railroad. Also a Kansas City Southern line may also bee seen from upper floor rooms. Behind the hotel is White Rock Junction and the Renner Connection, this is the junction between the KCS and the DGNO. The DGNO has a Hot Box detector in the area behind the hotel (MP-591.1). I am unsure of how many trains per day travel these lines.